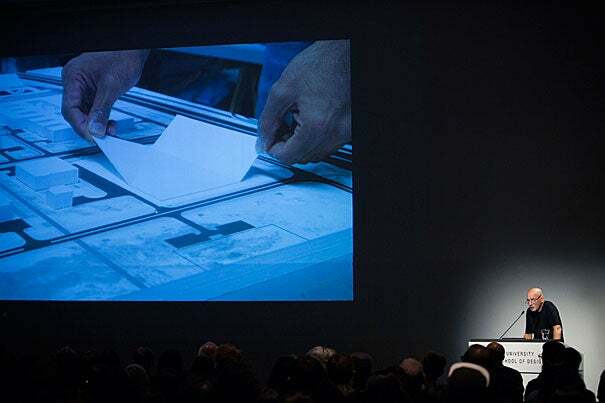 Architect Rem Koolhaas speaks to a Piper Auditorium audience of students and faculty about the political tensions in Europe and the radical futurism characteristic of his buildings. Architecture should be more than an intersection of art and commerce. “I see architecture as almost a political work,” said Remment “Rem” Koolhaas, the superstar Dutch architect, touching on his signature ethos, his condemnation of architecture’s passivity and its inability and unwillingness to confront or resolve the socio-political complexities of urban life, problems often stoked by globalization. A bold, trailblazing architectural theorist, writer, and a professor of architecture and urban design at Harvard Graduate School of Design (GSD), Koolhaas spoke about a changing Europe and the ideas behind four recent projects in Taiwan, Russia, Qatar, and Milan, his “current preoccupations,” before a capacity crowd at GSD Tuesday evening. Sometimes compared with Le Corbusier for his work’s global reach, its rejection of nostalgia, and its enduring focus on the urban metropolis, the Pritzker Prize-winner is one of architecture’s most prolific and influential figures of the last 50 years. While there are many talents working in the field today, “There are very few people who you can name around the world who manage to combine extraordinary inventiveness and innovation” in their design work and who are also “at the very center of contemporary thought, engaged with contemporary issues,” said Dean Mohsen Mostafavi in his introduction. 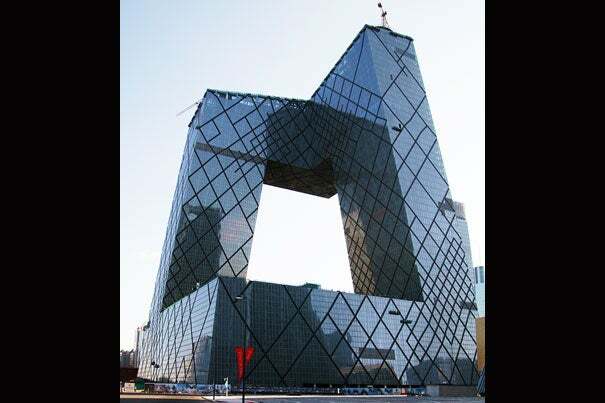 Rem Koolhaas and Ole Scheeren of OMA were the architects in charge of China’s Central TV Headquarters, while Cecil Balmond at Arup provided the complex engineering design. “We are in a radically divided world” in which “architecture is not dealing with those political issues in a really sophisticated way,” said Koolhaas, whose global design firm in Rotterdam, the Office of Metropolitan Architecture (OMA), includes a related research and design think tank focused on pushing architecture into broader cultural and organizational realms and producing exhibitions like the Venice Biennale (an event he calls “self-congratulatory”), corporate branding and strategic planning, media and publishing, and advancing energy technology. “I think that both the art world and the architecture world … are clearly dedicated to political correctness and therefore [are] pretty intolerant in terms of engaging” with political worlds beyond Western democracies. Known for his deadpan wit and blunt provocations when talking about his work and the profession, Koolhaas referred to himself as “a militant European” and sharply criticized what he sees as the “very dangerous” generational crisis between the old and young in Europe today. “People over 50 have a tendency to worry, and people under 50 have a tendency not to care,” he said, attributing the disastrous Brexit vote, which threatens to damage both Great Britain and the European continent, as well as the re-emergence of far right-wing political powers in Europe, to the casual negligence of young voter apathy. It’s a dynamic, he says, that’s compelled him to become even more vocal in his criticism of what he called the forces of pessimism and intimidation. Discussing his latest projects, Koolhaas said the outlandish design for a performing arts center in downtown Taipei was informed by the vibrancy and authenticity of street life that surrounds the site. The center, situated directly over a busy open-air night market, was inspired by a three-sectioned cooking pot used by the market’s street food vendors. Just as the three-sectioned pot allows the cook to prepare and serve three dishes at the same time, the center offers three theater spaces under one roof that can be connected when necessary. At the Fondazione Prada, an ambitious museum, theater, and display space for the Italian luxury brand in Milan that’s still under construction eight years after it began, Koolhaas described the alternation between open and closed spaces, the juxtaposition of elements preserved from an old distillery that used to occupy the site, and the modernity of the reflecting, mirrored structures as a way of conceiving and thinking about today’s Europe, a political body that’s both old and young. “I’m not saying that that is all untrue, but you can read the exact opposite in what we do. You can say it’s an extreme or better-disguised form of artistic drive, or maybe the elements we use are better camouflaged or more abstract. So I don’t think it’s fundamentally different, but I think that we are simply more reluctant to impose our own individual stamp or better able to hide that,” he said. Physician and violinist Lisa Wong (in pink) was among the members of the Longwood Symphony Orchestra who described the connection between music and medicine during a panel discussion at the Ed Portal.